Now available, for instant download at Smashwords, Amazon Kindle, Apple, B&N, OverDrive, Scribd, Oyster, Kobo, and more. Why should you read the Art of War for Today, the answer is simple: Sun Tzu said “Therefore the clever combatant imposes his will on the enemy, but does not allow the enemy's will to be imposed on him”. In one sentence he nails what we try to do each day, impose our will on the world around us. It does not matter if we are at work, home, play or relaxing. To be happy and successful we need to impose our will on the madness that surrounds us on a daily basis. When you solve a problem, you have imposed your will on that problem. When you get that job you wanted, you have imposed your will on those who were doing the hiring. When you pass that exam, you have imposed your will on that activity. This is just a taste of what Sun Tzu offers. 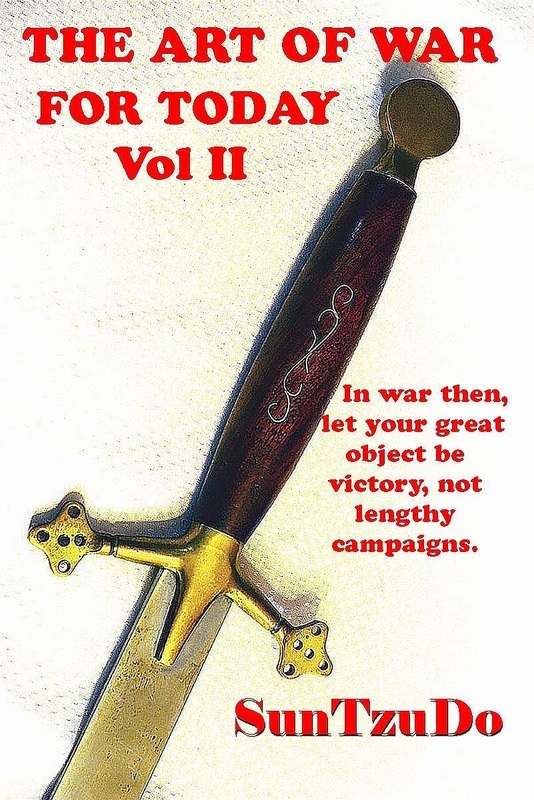 The Art of War for Today Vol II, lays it out on many areas that can help you improve your life, happiness and success. You have probably heard other quotes like “All war is based on deception” and “Hence the saying: If you know the enemy and know yourself, you need not fear the result of a hundred battles. If you know yourself but not the enemy, for every victory gained you will also suffer a defeat. If you know neither the enemy nor yourself, you will succumb in every battle” but was does it mean? Really mean? This is where this ebook becomes your friend and guide. It helps translate what was written 2,500 years ago. It explains the relevant and application of this wisdom that you can apply in your daily life. Forty-three chapters and over ninety thousand words for you to enjoy. Drawn from life experiences, it is a perspective on the Art of War you will find nowhere else. With a better understanding you will make better decisions and so have a real shot at a better life. Become a warrior and stop being a worrier. One reader says: A wonderful book to read. A whole new different perspective of Sun Tzu's Art of War. The author's knowledge of the book makes it delightful to read. Well written and hard to put down. Very good read. Another reader says: Rather than writing about how to win wars with a sword and chariots like his ancient counterpart, author Doug Nash has written 'The Art of War for Today' on how to win the wars in life through proper decision making. These ‘wars’ could be a job interview, business negotiating or overcoming laziness. Drawing upon stories and his meticulous knowledge of the thirteen chapters in 'The Art of War', Nash supplements Sun Tzu’s original material with his unique commentary that sets his book apart from those who have written about the ancient text. A notable example of this is a chapter devoted to a young bird’s story about the consequence of his actions and how it ties in the principles of 'The Art of War'. For those of you who may have struggled to understand the ambiguous nature of Sun Tzu’s writings, this book addresses those concerns by deciphering the material in a simple and straightforward way (but in a modern context), making 'The Art of War for Today' a worthwhile read for anyone over the age of fifteen. I strongly recommend you read this book as it will change your perspective on life and is a blueprint on attaining success.